If you’ve ever lived near a yappy dog, you’re probably familiar with the violent, intrusive thoughts that appear when you’re subjected to its high-frequency wrath. Hell, you maybe even got as close as researching animal sedatives before realizing you’d never actually harm a dog. 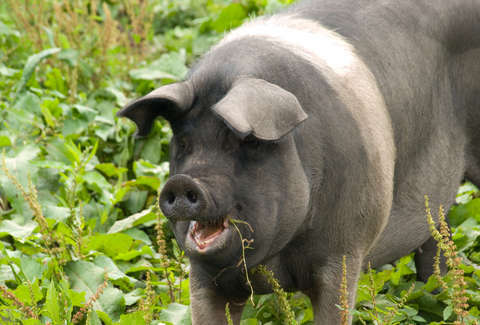 But what happens when a neighbor’s beloved pet pig is on the loose in the neighborhood? Anarchy, that’s what. Shortly after a message about a runaway pig was posted to Humbolt Paws Cause of California, local police were able to find and capture the 400-pound animal, Princess, in someone’s gated yard. As a report by HuffPo explains, the cops left Princess with the neighbor to watch while they tracked down the pig’s owner. But upon returning two hours later, the police found Princess being slaughtered by another person who had been visiting the neighbor’s home. Apparently, the guest had gotten to work very soon after the police left, and the homeowner had no idea the pig was being butchered in the driveway. Carrie Hogan, the pig’s owner, was shattered by the news. She’d bottle-fed Princess from piglethood. Thankfully, she didn’t witness Princess’s demise. Police are reportedly still investigating the bizarre incident, but have charged the man who slaughtered the pig. And for the record, killing a pet pig makes you a felon. Ruby Anderson hopes this doesn't give you any ideas.